Wondering how long you’ll have to wait before you can get your hands on the Samsung Galaxy Note 2 and the Nokia Lumia 920 via AT&T? Well, it looks like it won’t be for long. Rumors are pouring in that the Samsung and Nokia’s respective flagship devices, the Samsung Galaxy Note 2 and the Lumia 920, are slated to get a release date soon. According to one of BGR‘s trusted sources, the Galaxy Note 2 and the Lumia 20 will have an October 21st launch date with AT&T. Both devices were recently unveiled in events that were just days apart; the Nokia Lumia 920 was the highlight of a Nokia press conference last week while the Galaxy Note 2 was showcased last August 29th during the Samsung Unpacked event in Berlin. Both devices should appeal to people looking for phones with sizable screen real estate. The Nokia Lumia 920 has a 4.5 inch screen while the Galaxy Note 2 comes with a slightly bigger 5.5 inch display that pushes it into the phablet category. The Galaxy Note 2 also comes with an S-Pen stylus, perfect for people who like to doodle and take handwritten notes on their devices. The Nokia Lumia 920 on the other hand, running Windows Phone 8, may prove intriguing to people who would like to try something other than Android or iOS. There are also rumors that Verizon may pick up the Samsung Galaxy Note 2 sometime in the Autumn but if that happens, then it will go toe-to-toe against another phablet that’s already part of the Verizon line — the LG Intuition. Looks like AT&T subscribers will have a hell of a time deciding which phone they’ll be getting especially if these two drop at the same time. 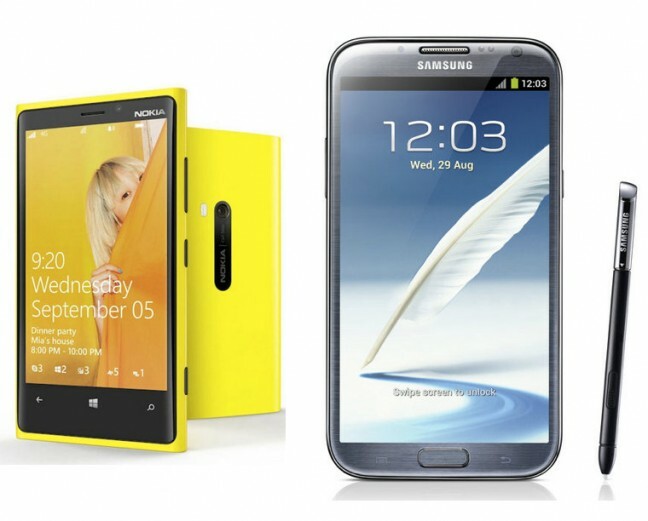 So which one will you be picking up — the Samsung Galaxy Note 2 or the Nokia Lumia 920?